Maintaining close relationships with partners around the world continues to be a valuable and important tool for program development and recruitment. 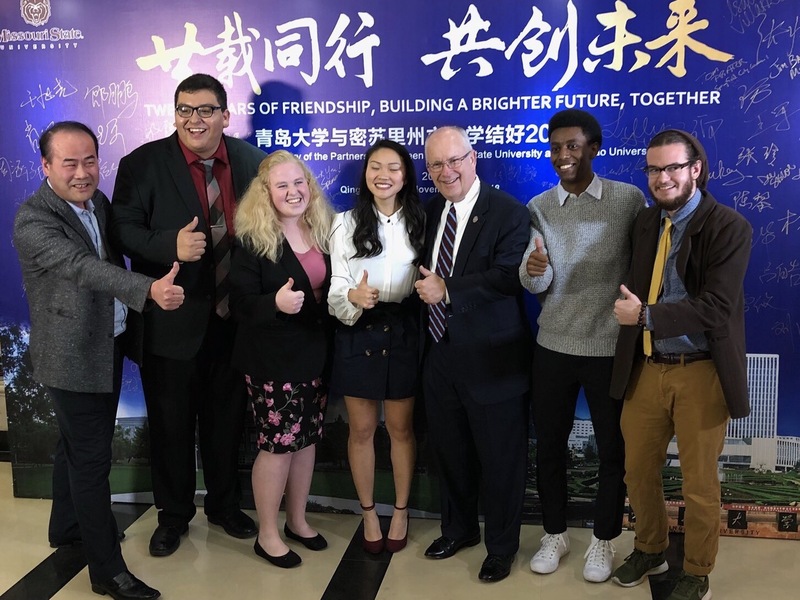 November saw members of the Board of Governors, university administration, and Student Government Association leaders travel to China to represent Missouri State University. The delegation visited the LNU-MSU College of International Business October 31. Missouri State officials met with Liaoning Normal University President Li and the LNU-MSU leadership team to discuss budgets and finances. The delegation also had the opportunity to meet with LNU-MSU faculty, staff, and students. This momentous celebration occurred on November 1 in Qingdao, China. President Smart and Qingdao University President Xia signed a new agreement for a 3+1+1 masters degree in education, marking the beginning of another strong academic partnership. Tami Sutton received a plaque from President Xia recognizing her outstanding contribution to the international exchange & cooperation between Missouri State and Qingdao University. This honor recognizes her work to help countless students from the US study at Qingdao University. Missouri State alumni shared their experiences at Missouri State during the anniversary celebration. A major highlight was the impact the International Friends program made on them during their time in Springfield. A quick bit of travel saw the delegation in Ningxia, China on November 2. Missouri State officials met with Ningxia University leadership team. President Smart received a painting of the first building of Ningxia University from Ningxia University’s President He. The group also hosted a alumni event in Ningxia, where around 100 alumni and friends shared happy memories of their time at Missouri State. President Smart renewed a 15-year training and research agreement with Director Li on November 2. He also presented a plaque to Director Li, commemorating the partnership between Missouri State and Ningxia Forestry Institute.